UNIVERSITY PARK — Trace McSorley and Penn State’s first-team offense did pretty much what it wanted on the game’s first two drives, leading the Blue to a pair of touchdowns in a 21-10 win over the White in Saturday’s Blue-White Game before 71,000 fans at Beaver Stadium. McSorley quarterbacked the Blue for most of the first half and completed 10-of-14 passes for 107 yards and one touchdown. He also ran six times for 41 yards. There was a question about how much McSorley would play, because the coaches also wanted to get extended looks at Sean Clifford and Jake Zembiec. 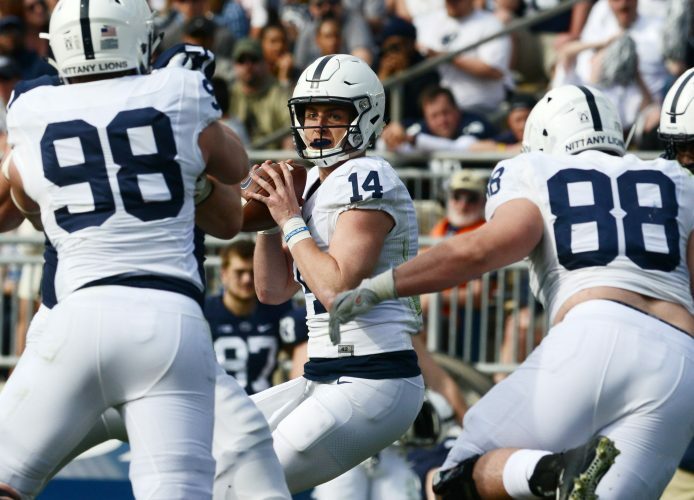 With backup Tommy Stevens out with a foot injury, McSorley wound up playing more than most expected. McSorley had a couple of runs into the secondary on the Blue’s first drive, but he was almost picked off on a deep throw to the left by cornerback DJ Brown. McSorley then hit Cam Sullivan-Brown for a 24-yard gain to the 10, and on third-and-goal from the 5, McSorley found Mac Hippenhammer in the end zone. The White went three-and-out, then the Blue put together another TD drive, ignited by a 19-yard run by Mark Allen. The Nittany Lions converted a fourth-and-3 from the White 23, and receiver KJ Hamler later took an end-around to the 2. Allen scored from a yard out for a 14-0 lead. The Blue offense was in position to score again on its next series when McSorley hit Hamler for a 43-yard gain, but Hamler lost a fumble. That was McSorley’s final play of the day, and he was replaced by Clifford on the next series. McSorley said Hamler was “beating himself up” over the fumble, but the quarterback also had high praise for the redshirt freshman. “He’s an explosive play waiting to happen,” McSorley said. Franklin noted that Clifford tweaked a hamstring last week, which limited his mobility somewhat. Still, the quarterback, who’s in line to be the third-stringer this fall, made some solid throws. Late in the fourth quarter, after the White had pulled within 14-10, Clifford threw a beautiful pass down the seam to Hippenhammer for a 29-yard score with 1:44 left to play. Clifford finished 4-of-8 for 59 yards. Offensive coordinator Ricky Rahne said he would be comfortable if Clifford had to play in a meaningful situation this season. The White team, made up of second- and third-teamers, had not scored in the Blue-White Game since 2015, but that drought came to an end Saturday when Carson Landis kicked a 34-yard field goal late in the third quarter. Zembiec, who has been battling with Clifford for the third-string quarterback job, guided the White on a scoring drive and threw a 3-yard TD pass to tight end Joe Arcangelo to close within 14-10 with 6:16 left to play. Zembiec finished 6-of-12 for 39 yards and one score, but he didn’t have many opportunities to make plays down the field. He also ran for 36 yards on six carries. McSorley was the leading rusher with 41 yards, while the Blue’s Johnathan Thomas had 27 yards on six carries and Allen 30 yards on five carries. Miles Sanders carried just three times for 6 yards, and the White’s Journey Brown had nine yards on six carries to go along with three catches for 27 yards. Hippenhammer had a big day receiving with two TDs and four catches for 43 yards overall. He also plays on the Penn State baseball team, which is amazing to his teammates and coaches. Sullivan-Brown had three catches for 37 yards. Defensively, heralded freshman linebacker Micah Parsons, who received a huge ovation being introduced before the game, tied for game-high honors with eight tackles for the Blue. The White’s Jason Vranic also had eight stops. Cornerback Zech McPhearson had a big day with three pass breakups for the White. Franklin came out of the tunnel locked in arms with comedian Keegan-Michael Key, a Franklin doppelganger and PSU alum who served as guest coach for the game. The two did the postgame interview together sitting side by side, which led to some funny visuals. Last year, media members took part in a halftime competition fielding punts. Penn State improved the entertainment value of that gimmick this year as it had AD Sandy Barbour, men’s basketball coach Patrick Chambers and other coaches field punts. The contest wrapped up with some of the best highlights of the day. Former PSU defensive lineman Anthony “Spice” Adams, who now works for BTN, fielded a punt and ran it all the way back for a touchdown, comically diving over the goal line. Along with DT Kevin Givens winning the Jim O’Hora award, the other spring awards were: RB Miles Sanders received the Red Worrell award (offensive player); WR Juwan Johnson and CB received the Frank Patrick total commitment award; and Johnathan Thomas received the coaches special teams award. WR Juwan Johnson was wearing a boot on his left foot and didn’t play, and LB Jake Cooper was on crutches. … The starting linebackers for the Blue were Parsons, Jan Johnson and Jarvis Miller. … Central’s Alex Hoenstine, a redshirt freshman, got in at wide receiver on the White’s opening series. … Brandon Polk and Johnathan Thomas handled kickoff return duties for the first team. … Former PSU offensive lineman Stefen Wisniewski was the game’s honorary captain. Wisniewski helped the Eagles win the Super Bowl in February. … Departed members of last year’s Fiesta Bowl championship team were introduced in the first quarter. … Former RB Saquon Barkley was presented the Chicago Tribune Silver Football trophy by Barbour at the half.